The national student loan debt has climbed to $1 trillion, with no sign of stopping. Those considering higher education need to seriously reflect on their ability to pay back the loans required for schooling. In the guide that follows, prospective students will learn about the short and long-term consequences of defaulting on their loans. We then look at a list of the 50 public and private schools with the lowest percentages of student loan defaults. Loans are considered to be delinquent on the first day a payment is late, and in default after 270 days without payment. The consequences of a defaulted loan can be severe, including a lower credit score, seized tax returns, garnished paychecks and legal action. While it cannot be definitively known why certain institutions have lower default rates than others, there are two highly plausible explanations. It can be a strong indicator students are graduating with smaller amounts of debt in general; whether because of lower tuition rates or higher scholarship and grant packages. Or it can indicate that students are finding jobs quickly after graduation, likely because of strong career services that allow them to maintain a payment plan. A recent report by Gallup found that students with over $50,000 of debt suffer negative effects to both their health and overall wealth. Students with significant debt also find themselves behind the curve when it comes time to purchase their first home or begin investing. Aside from facing potential issues from poor credit when applying for a homeowner's loan, many graduates find they simply aren't making enough money to balance paying their loans and owning a home. Thankfully there are other options. Many institutions recognize the growing debt crisis and provide tools to help students either avoid debt or be competitive for employment upon graduation. The schools on the list below are recognized for helping their students steer clear of obscenely large loans through alternative forms of financial aid, such as scholarships, grants and work-study opportunities. These institutions also work to ensure their students aren't left to fend for themselves after graduation. Read on to find programs that best fit both your academic and financial needs. Operating as an academically rigorous and selective private liberal arts college, CMC offers tailored programs focused on the individual needs of its 1,300 undergraduate and postgraduate students. 32 baccalaureate majors and one master’s level program in finance complete the academic offerings, with the top programs for 2014, including economics, psychology, international relations, biology, history, Spanish and philosophy. U.S. News & World Report ranked Claremont McKenna as the 8th best liberal arts college in the nation for 2015, while The Princeton Review gave the school the #1 spot for students that love their colleges. Small classes and devoted faculty only further contribute to the 96% retention rate among the freshmen class. Approximately half of the study body received scholarship and grant aid, averaging $35,693 per student. 16% of students took out loans to supplement the cost of education, accumulating an average debt of $8,446 per year. In 2015, The Princeton Review ranked CMC as the fourth university in the nation for best quality of life for its students. Located 35 miles from Los Angeles, Pomona College attracts undergraduate students from 47 states and 35 countries. The current population of 1,600 students enjoys a spectrum of course offerings, including innovative programs in arts, humanities, natural and social sciences and interdisciplinary studies. With an average class size of 15 and a student to faculty of 8:1, it is no wonder 97% of freshmen students choose to stay at PC after their first year. The college encourages students to develop a broad worldview, and over half of students take advantage of 50 study abroad programs in 31 countries. PC is focused on providing civic service opportunities for students through the Draper Center for Community Partnerships, which currently offers 14 different opportunities such as tutoring local students and delivering meals to homeless shelters. The university is known for providing excellent scholarship and grant opportunities; only 15% of all students took out a loan to pay for their education, with the average amount being $4,490 per year. While annual tuition totals $45,500, in the 2013-14 academic year, the average financial aid reward was $41,213. The school’s large endowment covers not only tuition and fees, but extends to room-and-board charges as well. Located 75 miles north of New York City, Vassar College is home to nearly 2,500 students at the undergraduate level, with students from over 60 countries accounting for nearly 10% of the school’s population. The college is highly selective, but offers esteemed academic programs in return. U.S. News & World Report ranked VC as the 11th best liberal arts college in the nation. The most popular degrees include biology, English, economics, political science and psychology. Graduates are known for pursuing further education within five years of graduating, including medical and law school. In the most recent academic year, 24% of all applicants were admitted; of these, 96% chose to stay at Vassar after their first year. The college has a need-blind policy, meaning admissions are never based on prospective students’ financial situations. In addition to meeting 100% of the demonstrated need for admitted students, the school also eliminates or reduces loans for students from low-income families. In 2012-13, 63% of all students received a scholarship or grant, averaging $38,545 yearly. Swarthmore is located just outside of Philadelphia, with a 425-acre arboretum as its homebase. Approximately 1,500 undergraduate students select from more than 40 degree programs, popular choices include humanities, social sciences, natural sciences and engineering. The college places great emphasis on graduating students who care about the world around them: more than 60% of the student body takes part in volunteerism. A student to faculty ratio of 8:1 contributes to the 96% retention rate of first-time students pursuing bachelor’s degrees. As of 2007, the college’s Board of Managers eliminated student loans from financial aid packages, choosing instead to grant additional scholarships. U.S. News & World Report and Forbes Magazine both ranked Swarthmore as the third best liberal arts college in the nation. In the 2013-14 academic year, the average aid award was $38,701, comprised of campus jobs and scholarship funds. Operating as one of the larger private research institutions in the country, Notre Dame is well regarded for academics and sports, but also has many other facets. The university is ranked 16th for producing Peace Corps volunteers and is in the top 10% for students studying abroad. Nearly 12,000 students enjoy an 8:1 ratio with faculty members, contributing to the third highest graduation rate in the nation. Standout programs and areas of research include medieval studies, physics, biology, mathematics, accountancy and aerospace. 99% of first-time freshmen students choose to return to Notre Dame for their second year. The amount of grants and scholarships awarded each year averages $29,753 per student. Approximately 41% of undergraduates took out a loan to supplement educational costs, totaling $6,418 per year. Catering to approximately 3,800 undergrad and grad students, Bucknell is intently focused on ensuring graduates are able to enter the professional world successfully. Whether advising on how to maintain low amounts of debt or helping students find top paying jobs, the university is prepared to partner with students and their families to make a plan. The 9:1 student to faculty ratio fosters this level of care and contributes to the 94% of freshmen who come back to Bucknell after their first year. The unusually large amount of research undergraduates are able to complete is also a large draw. The average starting salary for the Class of 2014 topped $50,000. 97% of this class was employed, pursuing further education, volunteering or engaged in another activity within nine months of graduation. The average need-based financial aid package for the class of 2018 totaled $31,500 and included grants, scholarships, loans and work-study compensation. The Class of 2014 graduated with an average of $22,500 in federal student loan debt, approximately $6,500 below the national average. Stanford University is home to approximately 16,000 students and has slightly more graduate students than undergraduate students. With a 4:1 student to faculty ratio, the university stands out for providing excellent individualized support. Given its location in Silicon Valley, it’s no surprise that many notable alumni work in the tech industry, including the founders of Google, Yahoo! and Hewlett-Packard. The top five undergraduate degrees are computer science; human biology; science, technology and society; biology; and engineering. The school is highly selective; in the last academic year, 5.1% of undergraduate applicants were admitted. Stanford has a no-loan policy, meaning families earning less than $125,000 annually pay no tuition, while those below $65,000 do not pay for tuition or room and board. In the 2012-13 academic year, the average aid package totaled $40,460. 80% of students receive some form of financial aid. The Princeton Review’s list of dream colleges ranked Stanford as the number one dream school for both students and their parents. Caltech serves just over 2,000 students pursuing degrees covering 26 different topics. The school is focused on STEM, which has led to a higher percentage of male students: currently females make up 31% of the student body. The 3:1 student to faculty ratio ranks among the best in the nation and contributes to the 93% overall graduation rate of students. 51% of students receive financial assistance, with the average federal aid package totaling $39,813. The class of 2013 had an average of $15,010 in student loan debt upon graduation, nearly half the national average. Notable alumni include 33 Nobel Laureates, 58 National Medal of Science recipients and 13 National Medal of Technology and Innovation recipients. St. Benedict’s is a women’s only liberal arts college serving just over 2,000 students. The school is partnered with St. John’s, a male-only institution. Though separate campuses, students share a single academic program and take classes together. Learners can choose from 60 areas of study and enjoy classes with an average size of 19 students. Nearly 12% of students are multicultural, hailing from 31 countries. Graduates are well prepared to enter the real world upon leaving the institution: 20% move directly into further education, while nearly 80% find positions related to their degree or work in service-oriented roles. In the 2012-13 academic year, 100% of students received grant or scholarship aid, averaging $22,205 per student. Approximately 65% of students take out a loan to finance their education, receiving an average of $6,859 annually. Duke University is a private research institution serving nearly 15,000 students. The Times Higher Education World University Rankings placed Duke as the 18th best university in the world, while Newsweek ranked it 14th. The top majors for undergrads include economics, public policy studies, biology, psychology and biomedical engineering. While a Duke education costs over $60,000 annually when factoring in all associated fees, the university operates on a need-blind admission policy, meaning it promises to meet 100% of demonstrated need without knowing a family’s financial situation prior to admittance. 97% of freshmen choose to continue their education at Duke after their first year, and 94% of all students who started at Duke also graduate from the institution. A 7:1 student to faculty ratio likely contributes to these high rates. Approximately 50% of students receive some form of financial aid, including need-based funding, athletic aid and merit based scholarships and grants. The average amount for 2013-14 was $39,275 per student. Duke graduates have been awarded 25 Churchill Scholarships to study at the University of Cambridge, behind only Princeton and Harvard. 37% of undergraduates take out federal student loans, averaging $7,344 annually. Serving nearly 2,000 students, Rush University is the academic sister to the Rush University Medical Center. Students enrolled at this institution pursue degrees in the areas of medicine, nursing and health sciences, all of which are complemented by clinical experience in the hospital. Nursing programs prove most popular, while the medical college has the second highest percentage of enrollment. While recognizing that a career in medicine necessitates student debt, the university recently undertook a large fundraising campaign, allowing them to increase the amount of scholarships offered by 50%. In the 2012-13 academic year, 48% of students received grant or scholarship aid, averaging $8,231 annually. 70% of all undergraduates take out student loans, averaging $13,288 each year. The university’s School of Nursing consistently ranks within the top 5% of programs offering graduate studies. Operating as a private research university, Carnegie Mellon attracts students with numerous top-ranking programs, including computer science, visual communication and multimedia, information and technology management, engineering and drama. In 2013, 30% of all candidates were admitted, of which 94% elected to stay at CMU after their freshman year. The university is loved not only by students, but also guidance counselors. U.S. News & World Report surveyed high school counselors across the nation and found CMU to be ranked 15th nationally. 70% of students attending CMU are from out-of-state, while 17% are from foreign countries. 59% of undergraduates received scholarship or grant aid in the 2012-13 academic year, with an average amount of aid received equaling $25,059. 40% of undergraduates took out a federal student loan, the average amount being $7,372. Located in our nation’s capital, Georgetown has provided outstanding Jesuit-based education for nearly 230 years. The institution serves almost 17,000 students, with a higher percentage of postgraduate students taking advantage of top programs in medicine, law, public policy, foreign service and business. Forbes Magazine has ranked Georgetown as the 20th best research institution in the nation; the school currently holds the highest level or recognition from the Carnegie Classification of Institutions of Higher Education for research activities. Gaining admittance to GU is tough: in the 2014-15 admission cycle, 16.4% of applicants were accepted. GU has four campuses spread across D.C.: the undergraduate campus, the Medical Center, the School of Continuing Studies and the Law Center. The institution maintains a 92% graduation rate, meaning students who start at GU tend to stay there. In 2012-13, 42% of first-time freshmen received grant and scholarship packages averaging $34,086 annually. As a private business school, Babson College is recognized for its intense focus on providing an entrepreneurial educational experience to all students. Students from all states and over 70 countries attend Babson and work with nearly 1,000 mentors that walk alongside students as they plan and build entrepreneurial ventures. U.S. News & World Report has ranked the college’s entrepreneurship program as number one in the nation for 21 consecutive years, while Money Magazine placed BC at the top of all colleges in the country. Other popular programs include corporate strategy, microeconomics, sustainability, finance and international business. Bloomberg Businessweek gave the school an A+ for teaching quality in 2014. 91% of all students who began their studies at Babson also graduate from the institution. 45% of all incoming undergraduates received grants or scholarship aid, averaging $33,409 per academic year. Kalamazoo College has been serving students for nearly 200 years, making it one of the oldest higher education institutions in the country. These days, more than 1,400 undergraduates take advantage of nearly 40 majors. The school is consistently recognized for encouraging innovative learning, including a wide range of offerings in experiential projects, internships, civic engagement, and international programs. Top ranked degrees include chemistry, life sciences, physical sciences, economics, English and psychology. K continually strives to build a diverse campus to promote wider worldviews: as of 2015, the student body included 25% students of color. A 13:1 student to faculty ratio contributes to 92% of freshman electing to continue at KC after their first year. 100% of incoming undergraduates received some form of financial aid, with 98% obtaining grant or scholarship funds. The average amount for these awards was $22,839. In the 2014-15 academic year, the college disbursed more than $33 million in non-loan funding. Fairfield is a Jesuit university serving approximately 5,000 baccalaureate and postgraduate students with over 80 degree programs. 91% of the faculty holds the highest degree in their field, while the 11:1 student to faculty ratio allows them to build meaningful mentor relationships with students. The university works to promote diversity on campus, and currently 13% of students identify as African American, Hispanic, Asian or Native American. Students are well-prepared upon graduation; in a recent survey of the class of 2014, 98% had secured full-time employment or admittance to graduate school and service programs. 27% of these students found their jobs through internships, while 39% secured jobs via on-campus recruiting. 30% of students receive an academic scholarship, while 85% overall receive some form of financial aid. The Fiske Guide to Colleges named Fairfield as one of the best and most interesting colleges in the nation. In 2012-13, 51% of undergraduates took out a federal student loan, averaging $6,981. Located in the coastal town of Brunswick, BC’s nearly 2,000 undergraduate students can take advantage of 33 degree programs in the same setting as notable alumni Nathaniel Hawthorne and Henry Wadsworth Longfellow. The college has been called a "New Ivy" by Newsweek, signaling an education that is on par with traditional Ivy League institutions. Popular programs include political science, the natural sciences, English, economics and Romance languages. During the 2013 admissions cycle, 47% of first-time applicants were admitted. 50% of first-time undergraduates receive some form of financial aid; typical grant and scholarship packages average $36,007 annually. A further 20% of students elect to take out a federal student loan, averaging $5,890 per year. 93% of those who enroll at Bowdoin choose to complete their education at the institution. This private liberal arts college serves nearly 1,600 students on its historic campus, offering students 26 degree programs. Top majors include art history, intercultural studies for business, environmental studies and economics. There are 11 students for every one faculty member; of those who teach at the college, 92% hold the highest degree in their field. In the 2014-15 academic year, over 90% of students chose to return to Wofford for their second year and 82% stayed at the college until graduation. Though small, WC garners much attention: Forbes Magazine ranked the institution 58th on its list of America’s 650 Best Colleges. In 2014-15, 91% of students received financial aid, with total disbursements equaling $45.8 million. Gifts and grants between 2008-13 exceeded $67 million. Students who chose to take out a federal student loan received $9,770 on average. Located just outside Boston, Bentley offers 23 majors focused on business topics at the undergraduate and graduate levels. 16% of students come from outside the United States and represent over 80 countries. Bloomberg Businessweek gave the school the 20th position in its list of Best Undergraduate Business Schools, while U.S. News & World Report ranked it fourth for universities offering master’s degrees in the north. Students enjoy a 14:1 student to faculty ratio, and 78% of full-time teaching staff holds doctoral degrees. Those who choose Bentley for its well-regarded MBA program can choose from seven different concentrations. 90% of students complete one internship, while 60% complete more than one. 95% of the recent graduating class is employed full-time in a degree-related field; their average salary was $50,000. The average amount of scholarship and grant aid received by undergraduates in the 2012-13 academic year was $24,519. MIT is a highly regarded and academically rigorous private research university located in Boston’s neighboring city of Cambridge. Over 11,000 students are able to call MIT home after passing the 7.9% admittance rate. With 80 Nobel Laureates, 56 National Medal of Science winners, 28 National Medal of Technology and Innovation winners and 43 MacArthur Fellows, it would be an understatement to simply say MIT is a great school. Top programs include engineering, computer science, the natural sciences, business, economics, linguistics and mathematics. The institution is world-renowned and draws students from across the globe: in the 2014-15 academic year, 51% of students were minorities or non-U.S. citizens. 56% of students were awarded a need-based MIT scholarship in 2013-14, averaging $34,551 in annual aid. 32% of students attend MIT tuition-free. Of all students who begin their studies, 93% successfully graduate from the institution. Though MBU may only have 1,100 students, the degree offerings are surprisingly wide-ranging and include over 30 majors and eight graduate programs. Students hail from nearly every state and 11 countries; 30% are home-school graduates. Popular majors include pastoral studies, humanities, nursing, elementary education, business management and biology. There are 14 students to every faculty member, allowing professors to become mentors and trusted advisors to students during their time at MBU. As a Christian university, all students are required to live on campus until age 23 unless they live with family. During the 2014-15 academic year, 80% of students received some form of financial aid. All students are required to participate in local church ministry. Undergraduates took out federal loans totaling over $4 million in 2012-13, or approximately $6,709 per student. Macalester College serves an exclusively undergraduate population of 2,000 students, offering 37 different majors across 31 academic departments. Popular studies include biology, mathematics, economics, political science and psychology. 840 different courses are offered each year in classes averaging 17 students. Diversity is given great focus, and students hail from over 90 countries. Approximately 24% of the American student body identify themselves as students of color. The university is well-regarded academically as well: the 2015 U.S. News & World Report guide ranked Macalester as the 24th best liberal arts college in the nation. Macalester adheres to a policy of meeting the full financial needs of admitted students, a commitment that only one out of every 70 colleges offers. Approximately two-thirds of students receive financial aid, with first year awards averaging $40,994. In the 2012-13 academic year, 95% of first-time freshmen chose to continue their second year at Macalester. Oberlin College has the impressive distinction of being the first postsecondary institution to regularly admit female and black students. The same devotion to diversity and expanded worldviews is still seen today: 20% of learners identify themselves as students of color, and the college is also ranked among the 20 friendliest campuses for LGBT students. Great emphasis is placed on arts and science subjects: of the 2,900 students currently enrolled, more than 80% study topics in these fields. The remainder of students take up degree programs from the conservatory of music. The student to faculty ratio is 11:1, and over 70% of classes have less than 20 students. Over $57 million in grants are awarded to students each year. Nearly 90% of students to begin their educations at Oberlin also graduate from the institution. 37% of undergraduates take out federal student loans, averaging $6,914 annually. The student body at Wesleyan is comprised of approximately 3,000 students at the undergraduate and postgraduate levels. Operating as a highly-selective private liberal arts college, 22% of applicants were admitted for the 2014-15 academic year. Of these, 15% were international and 36% students of color. Popular areas of study include mathematics, the sciences, astronomy, music, film studies and theatre. Unlike other institutions, students are not required to take prescribed general education courses, leading most to create degree programs that are highly interdisciplinary in nature. U.S. News & World Report ranked Wesleyan as the 15th best liberal arts college in America for 2015. Wesleyan is committed to a policy of meeting the fully demonstrated financial need for all students admitted. 53% of the class of 2019 received financial aid. 15% of students admitted are the first in their family to attend college. Operating as a private research institute, over 7,000 undergraduate and graduate students take advantage of over 65 programs of study. In 2014, U.S. News & World Report ranked the school as the 11th best in the nation for undergraduate teaching, and the 27th best institution overall. The schools of law and medicine also consistently rank among the best in the U.S. Diversified worldviews are encouraged among all students, and more than 60% take part in a study abroad program while at WFU. A low student to faculty ratio of 11:1 creates lasting bonds of mentorship and guidance among learners and their professors, contributing to a retention rate of 93%. 64% of incoming freshmen received scholarship or grant aid, averaging $24,188 per academic year. Students electing to take out a federal student loan received an average amount of $7,426. Wake Forest is well known for producing top scholars, including 15 Rhodes Scholars, four Marshall Scholars, 15 Truman Scholars and 62 Fulbright recipients. Just outside Washington D.C., George Mason University is committed to providing academic excellence at an affordable rate. With 81 undergraduate and 126 graduate programs, students of all backgrounds and interests can find a program uniquely suited to their goals. In addition to providing millions of dollars in funding every year, the institution is focused on preparing students to be competitive for top jobs upon graduation. Innovative internship programs and continual career networking opportunities ensure students gain experience and build contacts throughout their education, giving them a number of options upon graduation. In the 2013-14 academic year, 56.4% of students received financial aid, consisting of grants, loans, waivers and work study opportunities. The university has been recognized for its graduation and retention rates, specifically for historically underrepresented students Education Trust saluted the school for having little to no variance in graduation rates among African American, Hispanic and White students. With nearly 34,000 students currently enrolled, George Mason is Virginia’s largest public research university. With an endowment of over $78 million, James Madison University offers a variety of foundational, departmental and individual scholarships to both incoming and existing students. 122 degree programs spread across all academic levels are currently available, with the College of Business receiving consistent national recognition for its programs. A student to faculty ratio of 16:1 contributes to a 92.4% retention rate among the 20,000+ undergraduate and postgraduate students. The institution is committed to maintaining high levels of academic excellence and low tuition rates: in-state undergraduates can expect to pay approximately $9,662 annually, while out-of-state tuition totals $24,522. In 2013-14, undergraduates at JMU received financial aid totaling $39,945,219, including 2,570 Pell Grants. 60% of full-time, first-time students receive financial aid. The Princeton Review recognized JMU as one of the top schools in the nation "with a conscience," based on the number of students involved in volunteer and community service initiatives. The university offers a net price calculator to help students figure out exactly how much a JMU education will cost. Founded in 1889, Clemson University has a long history of providing the highest levels of academic excellence from its 1,400-acre campus in the Blue Ridge Mountains. Over 22,000 bachelor’s, master’s and doctoral students have access to nearly 200 degree programs, including innovative courses in automotive research, economics and education. A $623 million endowment allows the university to claim U.S. News & World Report’s third place rank for having the most financial resources per student, totaling $26,293. The university has been recognized for having one of the highest retention rates among all institutions, due in part to a low student to faculty ratio. U.S. News & World Report ranked Clemson as the 20th best public university in the nation. In-state students pay $13,043 in tuition annually, while those from outside South Carolina pay $30,488. 91% of undergraduates in their final year of study reported they would pick Clemson again if given the opportunity. Students seeking excellent value for cost will find this and more at the University of Illinois. In the 2013-14 academic year, nearly 45,000 students took advantage of over 150 programs of study at this institution, which U.S. News & World Report ranked as the 11th best public university in the nation. Career prospects at graduation are multiplied due to the emphasis placed on recruitment opportunities: in 2011-12, over 6,700 companies recruited on campus, including 70 of the nation’s Fortune 100 companies. Graduates are assured of a recognized and respected degree, with notable alumni including 23 Nobel Prize and 19 Pulitzer Prize winners. 43% of all undergraduate students take out federal student loans to cover the cost of their educations, averaging $6,220 per year. With over 24 million items inventoried, the institution has one of the largest public university libraries in the world. In a report on the most "disability friendly" campuses in the nation, UI Urbana-Champaign ranked #1. Operating from six campuses across the state, the University of Connecticut offers its 30,000+ students access to 123 degrees and a number of minors not available as full programs. The institution partners with Connecticut Community Colleges to offer a guaranteed admissions program as a means of offsetting the cost of a full four-year university education for academically qualified students. With a freshman retention rate of 93%, and overall graduation rate of 70%, the large majority of students are pleased they chose UC. While in-state undergraduates paid $9,858 during the 2013-2014 academic year, those from outside Connecticut paid $30,038. The university is focused on increasing access to college education for minorities: since 1995, the institution has enlarged its minority student population by 263%. In the 2014 fiscal year, the university dispersed over $428 million in financial aid via scholarships, grants, loans, student employment and tuition waivers. 39.6% of all tuition dollars are dedicated to financial aid. UConn ranked 15th among 58 public research universities in graduation rates for freshmen. Though one of the newer schools on our list, CNU has accomplished much in its 55 year history. As the number two "up-and-coming" regional university in the South according to U.S. News & World Report, its more than 5,200 undergraduate and postgraduate students have much offered to them. The 260-acre campus is home to numerous notable programs, particularly in the business and STEM tracks. In-state students can expect to pay $11,370 per semester, while their out-of-state peers pay $17,379 each term. The university offers a number of methods to cover these costs: in 2013, 43% of students received some form of financial aid. Sources include scholarships through academic achievement, proof of need and private donors. Students also have access to loans, grants and work-study programs. Forbes Magazine ranked CNU fourth in a survey of Best Colleges for Minorities in STEM programs. Classes are kept small, averaging 25 students per faculty member. CNU maintains strong relationships with local organizations able to offer student internships, notably Langley Air Force Base and the Jefferson Lab. Nearly 50,000 students call the University of Florida home, and with good reason: 16 colleges and over 150 research centers and institutes ensure all students have access to programs matching their goals. Courses include business, education, medicine and law, all of which are ranked in the top 50 graduate programs according to U.S. News & World Report. The college is also devoted to its minority student population: among AAU accredited public universities, UF tops the list for master’s degrees awarded to Hispanic students. Over 60% of the student body has no student debt upon graduation. For those who do, the average amount is $20,700, compared to the national average of nearly $30,000. SmartMoney included University of Florida on its list of institutions with the highest return on investment for students' tuition. UF is considered to be a "Public Ivy," meaning it is a public university that is considered to provide an education on par with Ivy League schools. UU’s more than 30,000 students enjoy access to over 100 undergraduate and graduate degrees, including the state's only accredited architecture program and medical school. Other notable programs include biological sciences, particularly genetics. Utah-residents can expect to pay $6,706 in tuition fees per semester, while those from outside the state’s border will pay $21,296. While the majority of classes have 20-30 students per faculty member, some popular or general education courses can have over 100 students, a factor to consider if class size is important to you. 35% of undergraduate students take out federal loans to supplement the cost of their education, averaging $7,340 per academic year. The university has a retention rate of 88% for first time, full-time incoming freshmen. A large endowment allows the university to offer a variety of scholarships to all levels of students. As the first state-chartered university, UGA has a distinguished history of providing top-tier education. The school is also known for graduating students with low debt: 97% of in-state freshman earned the HOPE Scholarship in 2014. The university is recognized for the large number of major scholarships earned, with students joining the ranks of Rhodes Scholars, Gates Cambridge Scholars, Marshall Scholars and Fulbright Scholars, among others. Educational offerings range from baccalaureate to doctoral and include professional degrees in law, pharmacy and veterinary medicine. The current student body sits at just over 35,000 students. In-state undergraduates can expect to pay $10,836 per term, while out-of-state students will pay $27,682. A large endowment allows the university to offer a variety of scholarships to incoming freshmen, transfer students and current students. 94% of students receive some form of financial aid and graduate with an average debt of $5,960. 82% of students garnered a scholarship or grant, 21% were eligible for Pell Grants and 41% took out a federal student loan. As the oldest public university in the state, ISU has been serving students for over 150 years. Today, more than 20,000 baccalaureate and postgraduate students call the university home, taking advantage of cutting-edge programs in business, education, health sciences and social sciences. A student to faculty ratio of 18.6:1 contributes to the 81.3% freshmen retention rate. The university is recognized for its commitment to serving minority students: as of 2013, nearly 21% of students were of non-white Caucasian origin. In-state students pay tuition amounts totaling $13,293, while those from outside Illinois incur charges of $20,886. In 2014, 76.5% of students received financial assistance via scholarships, grants, loans, tuition waivers and work-study programs. Nearly 5,000 students qualified for Pell Grants in 2014. The average size of a student loan totals $7,295. Nearly 22,000 students take advantage of the University of Delaware’s more than 100 academic programs offered at levels ranging from baccalaureate to doctoral. A number of programs are ranked nationally, including public affairs, mathematics, engineering, physical therapy and city management. The historic campus, which dates back to 1743, is just one of the reasons over 92% of first-time freshman return their sophomore year; small student to faculty ratios also contribute to overall satisfaction. Annual in-state costs for full-time Delaware residents totals $12,354, while out-of-state students can expect to pay $30,692. 79% of undergraduate students graduate within five years of their initial enrollment. 82% of all students receive some form of financial assistance, including 70% who are awarded scholarships or grants. Total disbursement in 2014 for these types of assistance totaled over $24 million. 53% of attendees take out a student loan, with the average amount totaling to $7,831. UI's over 200 programs cater to nearly 32,000 students at every academic level, with standout degrees in psychology, business, audiology and nursing. Their firm commitment to low tuition rates for both local and out-of state students results in 39% of baccalaureate graduates entering the professional world with no student loan debt. As part of this commitment to helping students finance their educations, the university has disbursed over $62 million in scholarships to undergraduate students. This commitment to students is reflected in their retention rate: over 86% of first-time incoming freshman continued to their second year. A 2015 U.S. News & World Report survey ranked UI as the 10th best college for military veterans. 96% of alumni report that the time and money spent on their UI education was worth it. In the 2012-13 academic year, 83% of undergraduate students received some form of financial assistance, including loans, scholarships, grants or work-study compensation. Within this guide, Truman has one of the smaller student populations, totaling just over 6,000 students. The university is focused on serving undergraduate attendees, who make up nearly 96% of the student body. The school has been recognized as the top public university in the midwest for the last 18 years, with standout programs in accounting, business, communications and romance languages. The university’s commitment to providing individualized care for students is evidenced in the number of students who choose to stick around: no other public university in Missouri enjoys a higher freshman-to-sophomore retention rate. Competitive tuition costs also help: residents can expect to pay $7,152 each semester, while out-of-state students incur costs of $13,376. In the 2012-13 academic year, 99% of students received aid in the form of a scholarship or grant. In 2014, Business Insider named Truman as one of the top 20 public colleges with the smartest students. The Missouri Department of Higher Education reports that Truman is number one amongst public institutions in Missouri for highest graduation rates. UND is home to more than 15,000 undergraduate and postgraduate students taking advantage of 225 programs of study. With a student to faculty ratio of 19:1, the university enjoys a high retention rate. A strong emphasis is placed on preparing graduates to be successful upon graduation: 98% of recent graduates are employed or in further education programs. Those joining the workforce earn an average salary of $45,275 in their first jobs, with 85% employed in positions relating to their degrees. Students clearly enjoy their time at UND: 9 out of 10 reporting they would attend the institution again if given the chance. Potential enrollees worried about the cost of their education can rest easy, as tuition and fees for the school are 13.4% less than similar institutions within the 11-state region. The current class of students represents every state and over 60 countries. Approximately 88% of all attendees receive financial aid in some form, with 65% being awarded scholarships or grants averaging $3,908. 63% of students take out a loan to finance their education, with the average amount being $8,314. Since 1899, Appalachian State University has been providing quality educational offerings at an affordable rate. In addition to keeping tuition and fees low, the university provides a textbook rental program to offset the cost of expensive reading materials. Appalachian enrolls more than 18,000 students and offers over 150 undergraduate and graduate major programs through its College of Arts and Sciences, College of Fine and Applied Arts, Reich College of Education, Walker College of Business, University College, Hayes School of Music, Beaver College of Health Sciences and Cratis D. Williams School of Graduate Studies. Appalachian also offers a doctorate in educational leadership. Though a large public university, students enjoy small classes and personalized attention from their professors: the current student to faculty ratio is 16:1. Appalachian is committed to encouraging diversity across campus, with 12.8% of students identifying as a minority. 45% of students take out a loan to pay for their education at an average amount of $5,595. Financial aid comes from a variety of sources: in 2012-13, 39% of students received a scholarship or grant from federal, state, local and institutional programs. As part of the State University of New York (SUNY) network, the Cortland campus serves nearly 7,000 students, 90% of whom are completing undergraduate programs. Nearly 100 degrees are offered within the three academic divisions: arts and sciences, education and professional studies. Popular programs include exercise science, physical education and sports management. 83% of first-time freshmen decide to stay at the institution after their first year, due in part to a 17:1 student to faculty ratio. The institution also has the distinction of being named to the President’s Higher Education Community Honor Roll for four years running. 93% of undergraduate students hail from New York and 96% of them are 24 years old or younger. In the 2012-13 academic year, over $18 million was disbursed in the form of scholarships and grants, with each student receiving an average of $5,172. 84% of the student body receives some form of financial aid, including scholarship and grants, loans and work-study compensation. Western Washington University offers students a portfolio of more than 160 academic programs, the large majority of which are geared toward the undergraduate class, who make up 96% of the student body. In addition to a 20:1 student to faculty ratio, 88% of faculty hold the highest degree in their field. These factors and more lead to a high satisfaction rate among students: 82% of first-time freshman continue into their sophomore year at WWU. Top rated undergraduate programs include philosophy, politics, economics and industrial technology. The Fulbright program has recognized the university as a top national producer of Fulbright Scholars, producing nine in 2013. For the third straight year, WWU has ranked first in the nation among medium-sized universities for sending graduates into Peace Corps programs. Nearly $48 million in scholarships and grants was disbursed to undergraduate students in 2012-13, averaging $7,836 per student. Exactly half of students take out loans to finance their education; the average amount of aid received is $5,947. Operating from two campuses in Winona and Rochester, nearly 9,000 students are enrolled in 65 undergraduate programs, 12 graduate programs and one doctoral program. The most popular programs for 2013 graduates included studies related to business, education, health professions, communication and parks, recreation, leisure and fitness studies. WSU has a larger than average female student population; the most recent incoming class is 62% female. For the 2014-15 academic year, in-state students paid tuition fees of $8,750 while those from out-of-state paid $14,250. Nearly 82% of students applied for need-based aid, with 11% of these students having all tuition and fees covered. Students enjoy small classes and personalized attention from professors. The current student to faculty ratio is 20:1, with the average class size ranging between 20-49. Nearly $36 million in student loans was disbursed in 2012-13, with 64% of students receiving loans averaging $6,640. 63% of students received a scholarship or grant, with 41% of those awarded coming directly from WSU. Students can take advantage of 82 bachelor’s, 93 master’s and 66 doctoral programs at this public research university based in Chicago. Only 96 American universities receive the highest research classification by the Carnegie Foundation, and UIC is one of them. U.S. News & World Report ranks UIC's criminology, occupational therapy, pharmacy, physical therapy, public health, nursing and social work programs among the top 25 in the country, as well as recognizing them for being the tenth most ethnically diverse university in the U.S. Costs of attendance remain lower than national averages, with in-state students paying $4,763 per semester and out-of-state attendees paying $10,338. The 2015 Times Higher Education World University Rankings named UIC as the 18th best university in the world among those less than 50 years old. 80% of first-time students pursuing bachelor’s degrees continue at UIC after their freshman year. 82% of all students receive financial aid, with 67% being awarded a scholarship or grant and 44% taking out a loan. Over 90 degree programs are available to students at UNI in the colleges of arts and sciences, social and behavioral sciences, business administration, education and humanities. Student to faculty ratio is 16:1, likely contributing to the 83% retention rate for first-time undergraduates. The President’s Higher Education Community Service Honor Roll has recognized the institution on multiple occasions for its commitment to providing students with a number of community service opportunities. The Princeton Review has also recognized it as one of the most environmentally responsible colleges. Students considering a part-time MBA program should take note: U.S. News & World Report ranks UNI’s among the best. 55% of all undergraduate students at UNI were awarded a scholarship or grant, each averaging $5,304. In addition to scholarships and grants, 61% of students also took out a loan to cover the cost of their education. The average amount in 2012-13 was $6,247. Over 25,000 undergraduate and postgraduate students take advantage of more than 200 degree programs offered at five campuses across Michigan. In addition to serving students from all 50 states, 78 countries are represented in the student body. GVSU is committed to helping graduates find gainful employment: 90% of recent graduates are employed or pursuing further education. The university’s career center lists over 7,500 employment and internship opportunities, with over 750 employers taking part in campus career events. Michigan residents pay an average of $5,652 in tuition and fees, while non-Michigan students pay $7,992. 94% of full-time, dependent students receive financial aid, with average awards totaling $13,276. In the 2013-14 academic year, the university offered $253 million in financial aid, $74 million of which consisted of scholarships and grants. 66% of students elected to take out a loan to cover costs, with the average amount of aid received equaling $6,702. 82% of first time bachelor’s students elect to continue their education at GVSU in their second year. At just under 10,000 students, Radford University is able to provide the benefits of a large university, while maintaining a close-knit community. The student to faculty ratio of 18:1 helps foster strong student/professor bonds, which contributed to the 100% retention rate of part-time students in the 2012-13 academic year. A number of academic programs have received national accolades, including programs in nursing, interior design, business and education. Each academic year consists of two semesters, costing $9,360 each for Virginians and $22,046 for out-of-state students. Over $31 million in grant and scholarship aid was disbursed to undergraduate students in 2012-13. 75% of students received varied forms of student aid, including scholarships, grants, loans and work-study compensation. 32,000 students call UCB home, 82% of whom are undergraduates. In recent years, the university has placed special focus on growing its minority population and have increased the percentage of non-white non-caucasians by 45% in the last ten years. Similarly, the international student population increased by 7% in one academic year. Arts and science programs constitute the majority of academic offerings, but the school also has programs in engineering and applied sciences, education, environmental design, communications, music, law and business. The MBA program is ranked 26th among all public universities. Nearly half of all students take part in some form of civic engagement each year, consisting of volunteering, service learning and community service initiatives. UCB maintains a retention rate of 85% among first-time students seeking bachelor’s degrees. In the 2012-2013 academic year, undergraduate students received nearly $97 million in grant and scholarship awards, with each student receiving an average of $9,345. Located in the Upper East Side of New York City, Hunter College is home to over 23,000 students. Students have access to six different campuses spread across the city, with most specializing in a particular field of study. Six colleges within the institution offer courses in arts and sciences, education, health professions, nursing, urban public health and social work. While the large majority of students are from New York City, 11% of the students hail from outside the state, including other countries. U.S. News & World Report ranked the school 8th among public institutions in the north. Freshmen are confident in their decision to pursue education at Hunter College: the institution has an 87% retention rate among first-time bachelor’s students. 69% of incoming undergraduate students receive some form of financial aid via grants, scholarships, loans or work-study compensation. While NJIT has been educating students for over 130 years, the last ten years of the institution’s history have been significant: in addition to doubling the size of campus, significant funding has gone into creating cutting-edge research facilities. 125 undergraduate and graduate programs are on offer, with standout programs in a variety of research fields. Business Insider ranked the school third in the nation among America’s most underrated colleges, but word about the institution is spreading and it has become more selective in recent years. A student to faculty ratio of 16:1 likely contributes to the high levels of retention: in the 2012-13 academic year, 86% of first-time freshman elected to continue at NJIT after their first year. 10,646 undergraduate and graduate students are enrolled in STEM programs, well above the national average. Full-time incoming undergraduates received an average of $13,545 in grant and scholarship aid. 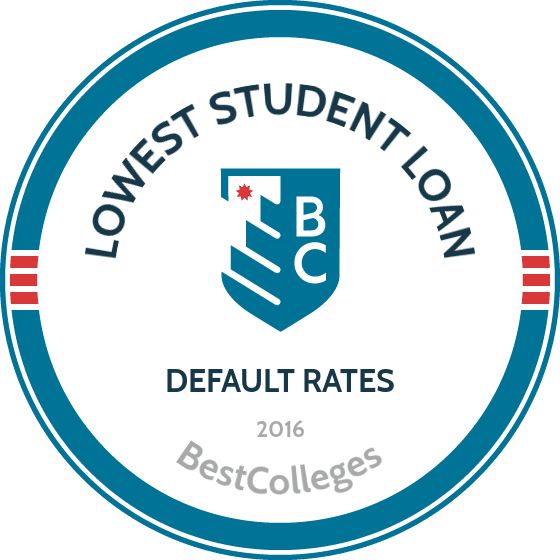 To finalize our rankings, we factored in not only student loan default rates, but also graduation, retention and acceptance rates to give you a list of schools that is as accurate as possible.